OCTOBER 5-7, 2019 – Save the Date! Details will be released in spring of 2019. In the meantime, check out the details from the 2018 trip below. Join Georgia River Network for a voyage down the Flint River! 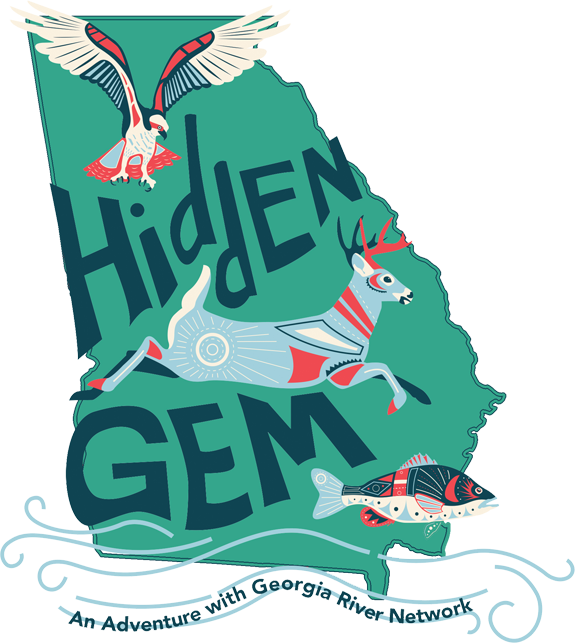 We’ll travel 48 miles from Baconton to Bainbridge taking in the best of the Flint–beautiful blue hole springs, lively shoals, rich history, abundant wildlife and more! Fashioned after our annual week-long Paddle Georgia events, we will tent camp on the river two nights at Rocky Bend Flint River Retreat. Like our annual summer adventure, we will enjoy catered meals, educational programs and great camaraderie as we make our way down one of Georgia’s most beautiful rivers during a beautiful time of year. The Flint river in South Georgia is fed by massive underground aquifers and runs clear and cool. While other South Georgia rivers offer up a plethora of sandbars and lazy bends, the Flint flows between limestone bluffs, over shoals and between picturesque islands. Along the way, crystal clear spring pools bubble up to feed the river. Off river, we will have the opportunity to learn more about the river and the region through tours of area attractions and nightly activities at campsites that include entertainment, games and programs highlighting the river’s cultural and natural heritage. It’s every bit as much fun as the original Paddle Georgia…just a wee bit shorter. On this 13-mile jaunt, the Flint really shows off, offering up the best of its surreal limestone bluffs, shoals, sycamores and cypress. Gnarled roots of these trees wrap through holes in limestone, stretching for the water as you paddle beneath these overhanging shelves of ancient rock. Best of all, the paddle ends at our campsite for the evening, a beautiful resort with plenty of campsites and cabins for rent! This beautiful 17-mile paddle is a testament to the unique nature of the Flint. In this stretch you will see just one tributary enter the river—the stunningly beautiful and memorably named Ichawaynochoway Creek. Here the river derives its flow from hidden springs that feed its clear water. Otters frolic in the shoals; bald eagles patrol the skies. Add to that the wreckage of a steamboat and you have the makings of a watery waltz you won’t soon forget. This 17-mile run is home to perhaps the most memorable blue holes on our course—including a billowing pool of crystal clear water nestled in the Baker County bank of the river known as Bovine Spring. Here the river races due south to the Decatur County line, flowing deeper and wider as it pushes further into the Coastal Plain. The journey ends on the backwaters of Lake Seminole formed by Jim Woodruff Dam at the Florida state line some 30 miles downstream. See the route map at the bottom of this page. *Registration fees include all meals for three days! How many people participate? 175 spots are available. Like our summer Paddle Georgia events, participants will range in age from 4 to 84 and come from all walks of life. But, they all have one thing in common—they love to paddle and they love Georgia rivers! Can I go for just part of the trip? Yes, but all registration fees are the same, regardless of how many days you paddle. Those not paddling all three days must make their own shuttle and boat pick-up arrangements. What does my registration fee include? Your Fall Float the Flint registration fee includes a T-shirt, boat decal, maps and river descriptions, a year’s membership to Georgia River Network, camping with bath facilities, shuttles to campsites, entertainment, activities, and educational programs. Breakfast, dinner and sack lunches are included in your registration fee. This includes 3 dinners for Oct. 4-6, 3 lunches for Oct. 5-7 and 3 breakfasts for Oct. 5-7. How much does it cost? How much would you pay for an all-inclusive educational adventure vacation? Famous theme parks would charge you hundreds, nay thousands. Georgia River Network’s natural Flint River theme park costs only $325 (with unlimited rides!). Registration fees are $325 for adults, $280 for children age 8-17, and $140 for children under 7. All meals are included. Participants garnering more than $650 in Canoe-a-thon donations may request to have their registration fees reimbursed. How will the Fall Float be different from the summer Paddle Georgia trip? With the exception of a few bells and whistles, the Fall Float will be very similar to our annual Paddle Georgia event. Catered breakfasts, lunches and dinners will be provided, and Café Campesino will be on hand with coffee, tea and other refreshments. Our Rocky Ford Flint River Retreat campsite is tent camping only, however cabins are available for rent for additional fees. Transportation will be provided to and from launch sites/take outs and because we’re using the same campsite all three nights, you’ll have full access to your vehicle for the entirety of the trip. What’s a Canoe-A-Thon? Like a walk-a-thon, Paddle Georgia’s 2020 Canoe-A-Thon beginning Aug. 1, 2019 will raise money for Georgia River Network. Each participant is asked to solicit donations on a per-mile basis. Those participants generating more than $650 may choose to have their Fall Float registration fee reimbursed, and the top Canoe-A-Thon fundraisers automatically secure registration for Paddle Georgia 2020. Click here for more details. Canoe-A-Thoners compete for gifts and prizes, including new canoes and kayaks and other great goods from our sponsors. These prizes will be awarded at Paddle Georgia 2020 (Canoe-a-thon participants do not need to present to win these prizes). Participants can sign-up and start raising funds Aug. 1. Do I need to be an experienced paddler? You don’t need to be an expert, but you do need a little experience. If you are new to paddling, we ask that you take a basic canoeing or kayaking instruction class offered through the Georgia Canoe Association or other instructors. What do I need to bring? You are responsible for bringing a canoe or kayak, paddles and a personal floatation device. Georgia River Network does not supply or rent boats. See our list of outfitters to secure your rental boat for the week. Also bring standard camping gear including a tent and personal items. Your boat should be of a size and weight that you and another person can carry. Where do we camp? During the Fall Float on the Flint, we will camp at Rocky Bend Flint River Retreat in Newton. This is a tent and RV camping only facility, but cabin rentals are available for additional fees directly from Rocky Bend Flint River Retreat. Indoor shower and toilet facilities will be available as will porta-toilets and heated outdoor showers. Prices range from $95-$180 per night. Do I need to bring food? Breakfast, dinner and sack lunches are included in your registration fee, but participants may choose to bring their own food. Camilla, 12 miles to the east of our campsite, is the nearest supply point with grocery stores, restaurants and other amenities. Where do I leave my car? You will have access to your car at Rocky Bend Flint River Retreat for the entirety of the adventure. At the conclusion of the paddle, shuttle buses and a tractor trailer will bring you and your boat back to Rocky Bend Flint River Retreat where you will retrieve your vehicle, load your boat and return home. Can I fish during Fall Float on the Flint? Yes, but you are responsible for obtaining appropriate licenses and understanding and following the proper rules and regulations. 1.) No alcoholic beverages will be allowed. 2.) All participants must attend the pre-launch safety briefing. Participants must adhere to the safety guidelines presented. 3.) Participants must wear a properly fitted U.S. Coast Guard approved personal floatation device at all times on the river. 4.) Participants under age 18 are the responsibility of, and must be accompanied by, a parent or guardian. 5.) Sorry, no pets allowed. 8.) All participants must respect private property along the river. 9.) All participants must have basic paddling skills and be capable of self-rescue in the water. 10.) No more than 2 children under the age of 12 per adult guardian. 11.) All participants, especially small children, must have a designated seat in the vessel in which they are traveling. 12.) Georgia River Network is not responsible for any personal property that may be lost, damaged, or stolen during the trip. Any registration cancellations made by September 30 will incur a 10% processing fee. After September 30, no refunds will be granted. If you have questions or need assistance, call our office at 706-549-4508.